Headed on the road this summer? No matter how long our trips are, it seems like the kids always get hungry. For long road trips I like to stockpile a bunch of snacks, but need to be careful to be sure they are not just filled with sugar and empty calories which can create even hungrier and more active passengers. This post 5 Organic Snacks for Summer Travel has been supplemented by free products from the companies I have photographed below. If you don’t find yourself prepared you are to have a tough time finding snacks that are healthy and reasonably priced. We are sharing this roundup of dangerously delicious organic snacks that can be affordably purchased and packed ahead of time so you can avoid busy airport newsstands and gas stations. Organic Fruits and Veggies. Wash and package them in a cooler for a quick and healthy snack. My kids like frozen grapes but organic apple slices and peanut butter or Organic carrots are a great road trip snack. 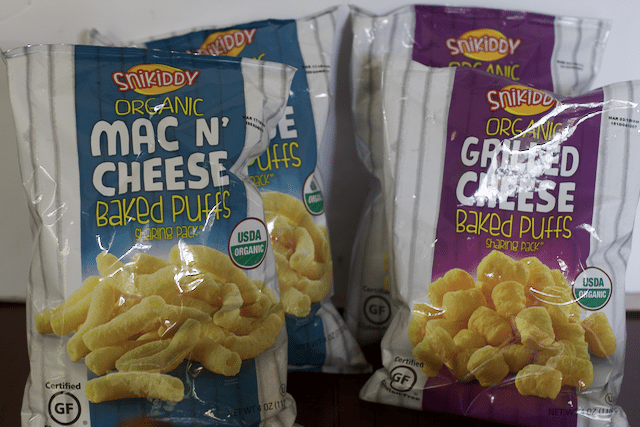 Snikiddy Organic Cheese Puffs (SRP: $3.49/bag) – A delicious new take on a childhood favorite, these USDA Certified Organic and Certified Gluten Free snacks will please both kids’ and parents’ taste-buds on-the-go. 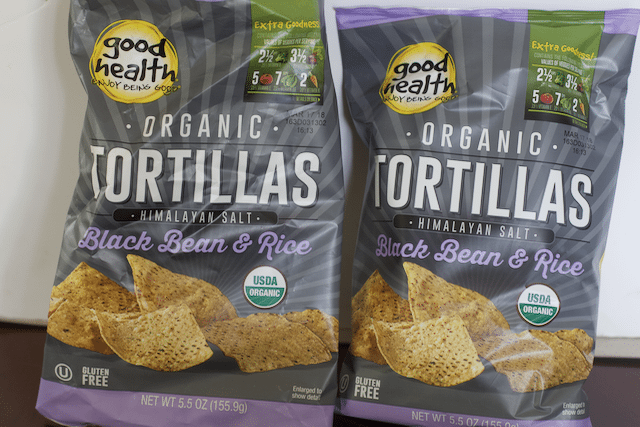 Good Health Organic Black Bean & Rice Tortillas (SRP: $3.49/bag) – perfect for munching during car trips and flights, these organic and gluten-free tortilla chips are a sneaky way to get in 5 veggies in every bite. Tortilla chips are my weak spot, and I could eat a whole bag of these… Hey if I am getting some veggie servings it’s ok right? 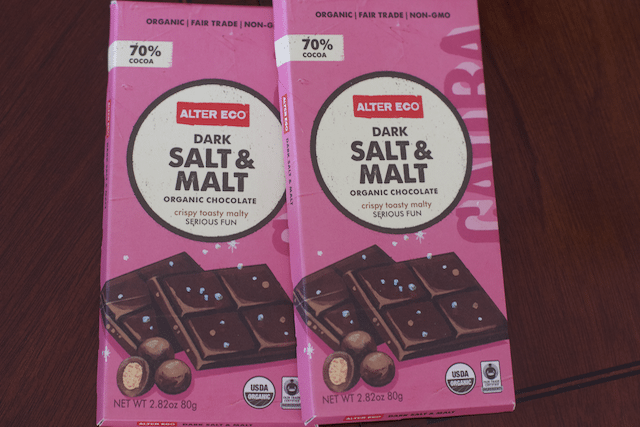 Alter Eco Dark Salt & Malt Chocolate (SRP: $3.99/bar) – created to satisfy any sweet tooth, this new fair trade and organic bar boasts nostalgic flavors that will make you reminisce about your favorite childhood malt ball candy. As the driver, I always crave something sweet to keep me alert. Alter Eco bars are really tasty. Bare Organic Toasted Coconut Chips (SRP: $5.69/bag) – baked – not dried or fried – these crunchy organic coconut chips are made with only 3 ingredients and are a good source of fiber. 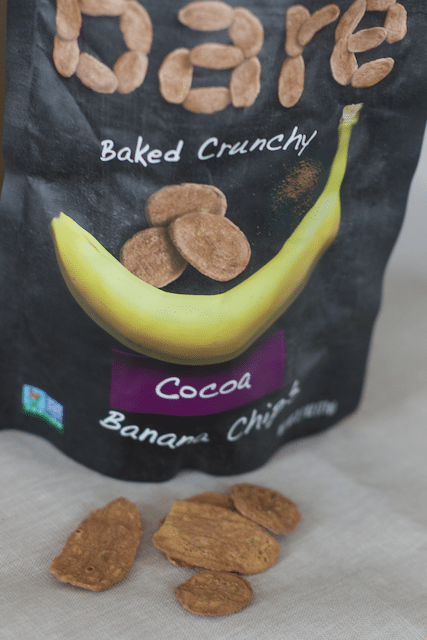 These are so much better than other banana chips. They are sweet enough for a snack or dessert option. 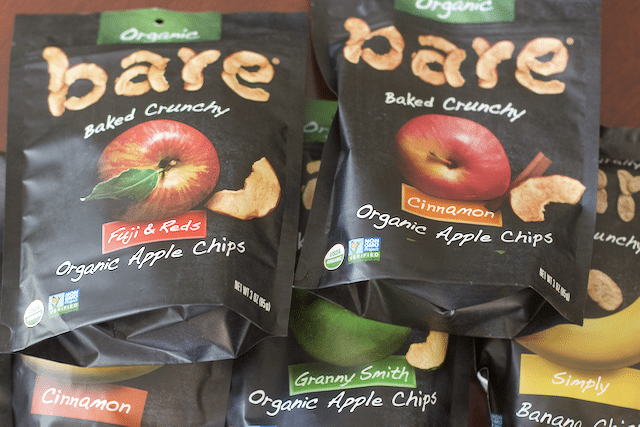 What types of snacks do you like to pack for your kids for road trips?